iSlide is an all-in-one add-in based on Mircrosoft PowerPoint. A must-have for who need to design appealing PowerPoint slides. Just select a graphic and let iSlide assist you in one-click circular/matrix duplication. A variety of parameterized settings meet your individual design needs. Designed by professional designers, the Theme Library contains themed fonts/colors/guides/layout presets. Rock PowerPoint theme colors just like change "skin". Well-matched color schemes allow you to click and replace. 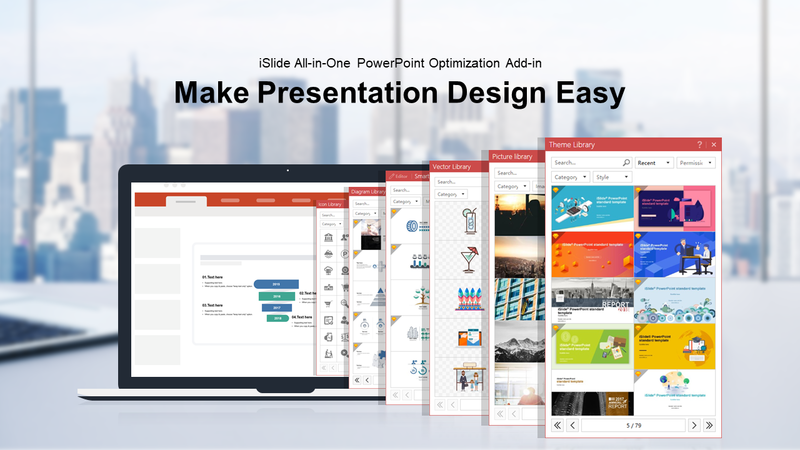 With 4000+ continuously updated PowerPoint diagrams, the iSlide Diagram Library provides more powerful resources and usage methods to help designers quickly make professional presentations, commercial road shows and more. Icons make the information more intuitive and easy-to-understand. Boasting the maximum editability, the Smart Chart allows you to change the icons (100k + icons available) and data (the graphics of the chart will automatically adjust with the value) at any time. It collects high-quality free pictures under the Creative Commons Protocol that can be used anywhere. It allows quick search and one-click insertion. Insert huge amount of vectors from the library by just a click. Join Images feature allows designers to quickly create prototype images without using PS. Generate a long image by just one click, best for viewing on Weibo, WeChat and other mobile browsers. Export important PowerPoint documents as non-editable format and videos and images with various parameterizations.